Bobber Frames For Sale and How To Buy Them! The bobber frames for sale on some websites are very good, and yet some are very bad, even dangerous. So what do you do? What you want to look for in a bobber frame is of course, the design you want. But more importantly you want quality welds, and if possible the right mounts for the engine and forward controls, unless you want to do all that yourself. 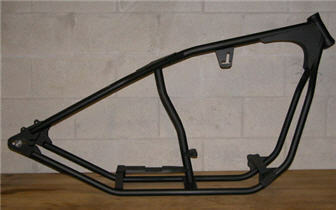 The main thing is to make sure the bobber frames for sale have the right tubing (DOM or even ERW, not pipe. Don't settle for less). Some builders take short cuts and save money on cheaper pipe, when in fact the load on the pipe can result in massive failure. You don't want that to happen on the way to Sturgis! Some bike builders will insist that regular pipe is ok, but it's not! 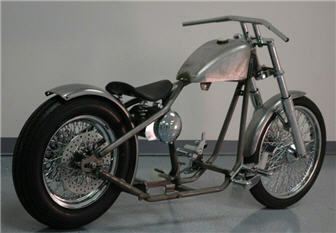 Above is a picture of a bobber rolling chassis for sale by American Classic Motors. Also, make sure the bobber frames for sale are properly titled in your state. It's not the deciding factor, but it will save you a lot of time and trouble. If your bobber frame for sale is not properly titled and registered then make sure every single part you get for your bike build has paper work filed and easy to find. Because when it comes time to get the bike registered, you are most likely going to need all of that paperwork. You can read this article for more information on getting frames registered and titled. But finding bobber frames for sale is easy! However, lots of these frames are home built, which is OK. But what is not OK is that many of these builders don't keep their receipts. You need receipts, and every sort of documentation on your build as possible because you will need most if not all of it to get your bike registered and titled. To find out exactly what you need go to your local DMV and find out what they require for a 'special construction'. That is how they classify a home built motorcycle frame (unless things have changed, and things change in government agencies all the time). The frame pictured to the left is a wishbone bobber frame by Motorcycle Stuff N More. With that all said, I recommend going to Ebay and searching for bobber frames for sale. There are tons of builders selling their bobber frames. I recommend going with a bike builder with over 100 positive reviews (as a seller). Or, buy a bobber frame from a larger, well known company like Demon Cycle, Bitter End Choppers and many others. Simply go to the manufacturer you prefer and ask if they have a bobber frame for sale, or if they can custom build a rolling bobber chassis for you.